Back in 2016 Hernani Olivera asked me to provide some advice for those seeking a career in conversation. Hernani is a bat scientist and another passionate science communicator. You should check out his blog HFMO Conservation and Science. When did you start working with conservation? My very first job after I finished university was in conservation. I was employed as a threatened species research scientist at the Arthur Rylah Institute for Environmental Research. This research institute is a part of the environmental department of the Victorian State Government in Australia. Our job was to conduct applied scientific research to answer ecological questions and give recommendations to the government on best methods for conservation. It was in this job that I first fell in love with bats and started to understand the complex conservation and human-wildlife conflict issues they face. Micaela Jemison with a Malayan flying-fox. Have you always dreamed about working in this field? I knew I wanted to be a zoologist at the age of 13. Growing up on a farm with frequent visits to the local river and forests gave me a love of animals from a young age. I was inspired by the BBC wildlife documentaries and Sir David Attenborough as many young ecologists are. I didn’t just want to study the environment and its ecosystems, I wanted to make a difference in the conservation of our natural wonders. That was my biggest dream. How did you build your career to get there? I started my conservation career like many students – going to university and completing a biology degree. I thought I would follow the well-worn pathway of many scientists before me – get an undergraduate degree, earn a PhD and have a research career in a university or government department. But life is rarely that straightforward. was lucky to get a research position straight out of university with the government environmental department. It gave me a sound grounding in scientific research and an appreciation for the ecological and political issues that conservation efforts face. It was in this role that I discovered my love for bats and my frustration at how our scientific recommendations for their conservation were not translated into government policy or communicated in the media. Bats face a massive public relations problem in Australia. When our flying-foxes were threatened by communities wanting to cull populations due to zoonotic disease fears, I decided my career would change course. So instead of furthering my career by earning a PhD in ecology, I did something very unusual for a scientist - I earned a master’s degree in communication and public relations. I was the only scientist in my entire course and I stood out like a sore thumb! But it was completely worth it. 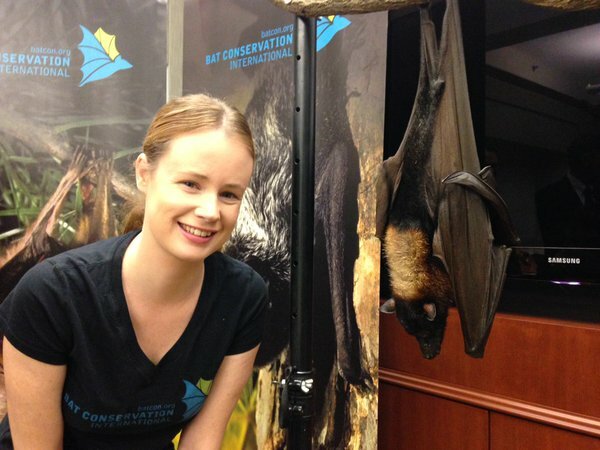 I took on greater public engagement responsibilities in my role at the Arthur Rylah Institute and when I moved to America it led me to work as a science communicator at the Smithsonian and now my current role at Bat Conservation International. What do you think are the most important skills to get a conservation job? An understanding of scientific research and biology is important, but not the only skill a conservationist should have. Understanding the ecological problems is only part of the conservation solution. Being able to communicate the science and being able to work with a wide range of organizations and communities is vital for someone who wants to make real conservation action happen. Which skills would you look for if you were going to choose someone to work in BCI? Most conservation work is actually talking with people or communities and working together as a team. Communication, cultural sensitivity and team skills are vitally important. Working with communities around the world to try to conserve the habitat and lives of an animal that is greatly misunderstood or even vilified in some countries is not an easy job. It requires a lot of patience and understanding of cultural differences and the needs of individual communities. Beyond great communication skills, project management skills and a strong background in the ecological sciences are also key. Can you tell us a little bit about how is your working day? One day is never the same as the next! I not only work with many different organizations, I also receive inquiries from people and communities from all around the world. Many people have questions about bats. My role is to help communicate the work that BCI and its partners are doing to conserve the worlds more than 1330 species of bats. Another large focus of mine is to help educate the public on the issues that bats face – from habitat destruction to human health concerns. Do you think a PhD is necessary for those that want to work with conservation? Which tips and advice would you give for those that want to follow a career in conservation? Don’t let someone tell you that you have to be a scientist to be involved in conservation. Conservation takes a team effort from a wide range of people – scientists, government environmental staff, land managers, fundraisers, communicators, politicians, community leaders, and much more. We need all of these people to make conservation happen. Scientists alone can only help understand the problems; it takes a conservation community to make conservation happen.